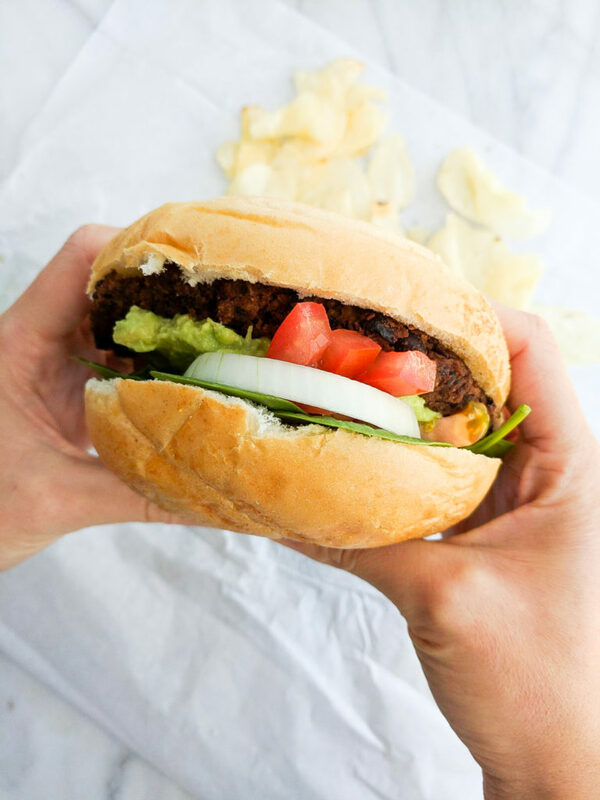 These Chipotle Black Bean Burgers are filled with wholesome ingredients, are super creamy and have a spicy kick to them! 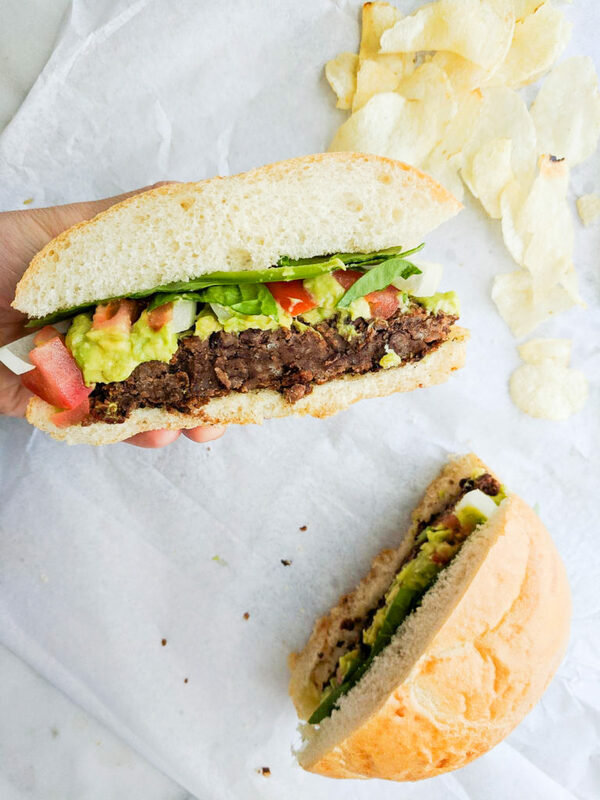 I have loved black bean burgers for the past few years now. 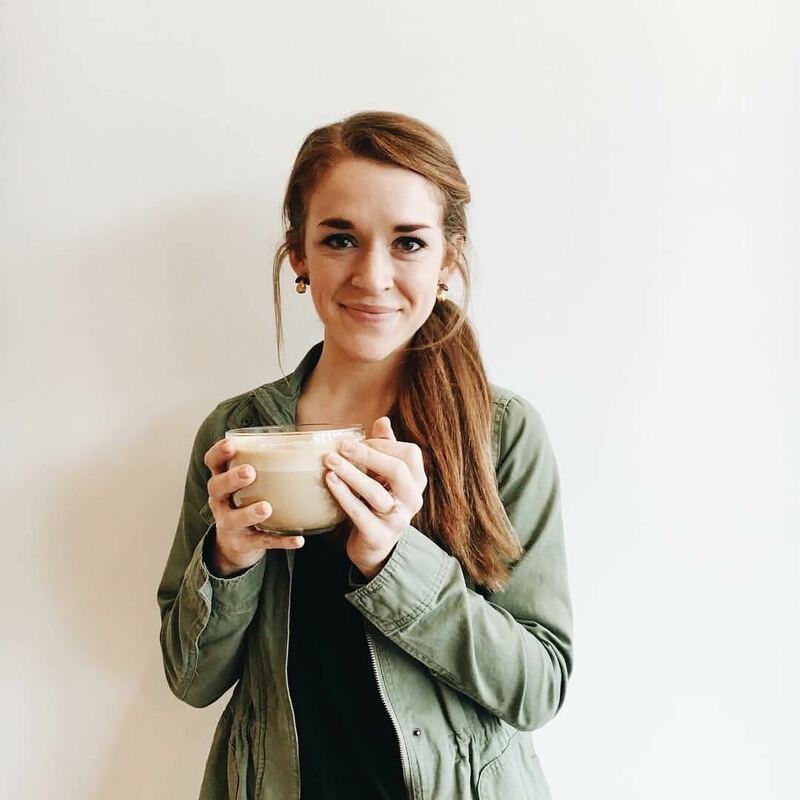 To read the full story on how I began to eat these delightful protein packed babes, look here. Ben and I usually eat the recipe linked above at least twice a week. However, we always try and diversify it a little bit. And since this week is Cinco De Mayo, I figured why not make a spicy Southwestern-esque style of bean burger! I love the smokiness of this burger. Ben and I just found out about Chipotle Peppers in Adobo Sauce and it’s truly changed our lives. The flavor packed into those containers is OUT of this world! I found mine at Aldi. It was only like, $1.00 and we have used it numerous times now. I highly recommend you pick this item up for this recipe! I thought about blending the peppers in a food processor, but then realized that there was already a bunch of sauce in the bottom of the can. So I just used a couple tablespoons of that sauce in this recipe and it gave those mashed up black beans some KICK! I loved it. 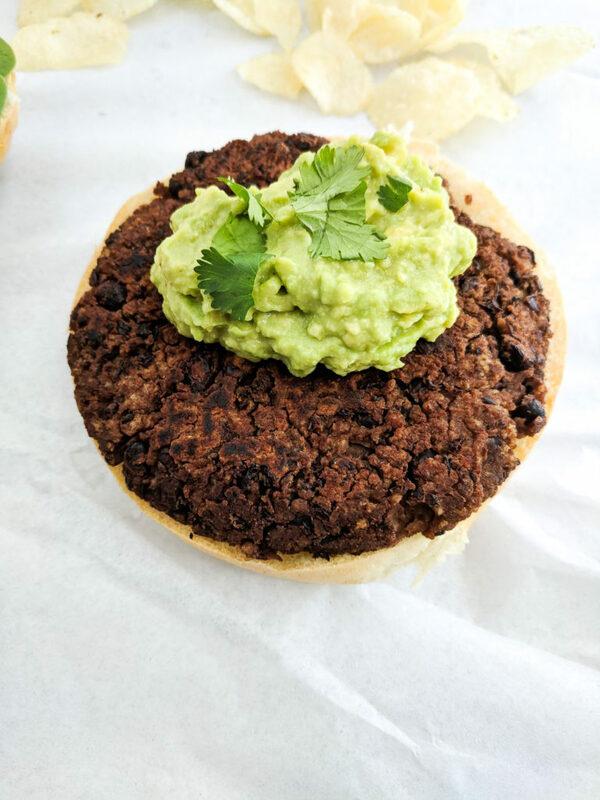 I also love that these chipotle black bean burgers remain crisp on the outside but super creamy on the inside. 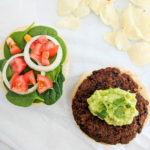 It’s pretty open as to what you want to top it with – but I used a big ol’ dollop of guacamole, spinach, tomatoes and onion! It was crunchy, creamy, crisp…all of the adjectives that start with a C! Ha! This would make for a great Cinco De Mayo dinner paired with a large Mexican beer and sunshine! Hope y’all enjoy. Xo. Begin by draining your cans of beans. Once they're mostly drained, place them in a large bowl and begin to mash them to where they are almost fully in refried bean style with a few whole beans still left in. Add in the chipotle pepper in adobo sauce, cumin, chili powder, salt, pepper, garlic and onion powder. Mix together. Adjust seasoning if necessary. Add in your egg and mix to combine. Add in your breadcrumbs last. Mix to combine. Section your bean mixture into fourths, take a fourth of the mixture in your hand, roll it into a ball and then flatten it into a patty. In a skillet over medium high heat, add a tsp of olive oil and begin to fry your patties. Cook on each side for 3-4 minutes until crispy. 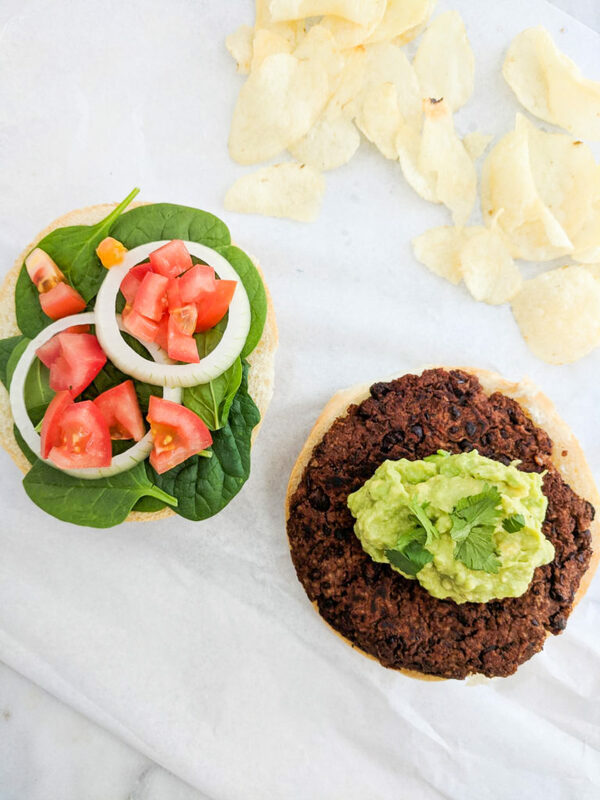 Place on a bun and load up with toppings of your choice! I added guacamole, tomatoes, onions and spinach. I bet a chipotle mayo would go great on this as well! Eat hot! Enjoy.